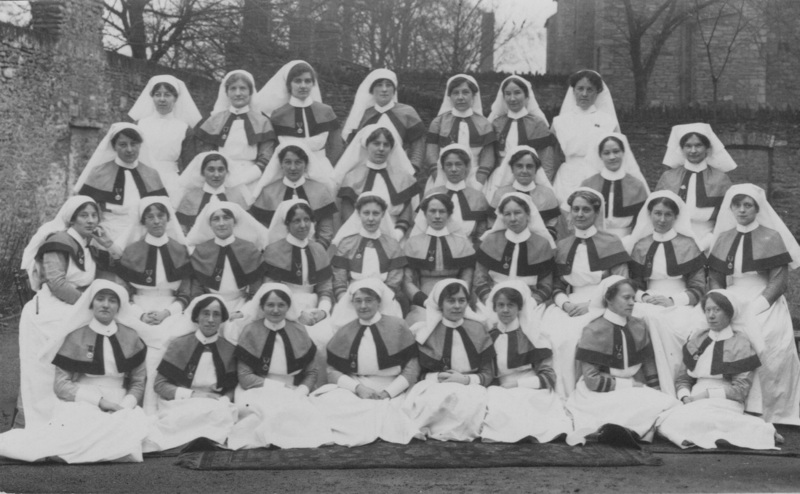 The War Office supplied the hospital with trained sisters and nurses from Queen Alexandra’s Imperial Military Nursing Staff Reserve. Women enlisted from the UK and from Australia, Canada and New Zealand. There were also nurses from The Red Cross and St John’s Ambulance. By 1916, the trained nursing staff had been so depleted by drafts being sent overseas that members of Voluntary Aid Detachments (V.A.D’s.) were enlisted to help. These women trained in preliminary first aid and nursing skills were as a group very much defined by being middle or upper middle-class young women, many of whom had never had any paid employment. They were fondly nicknamed ‘Very Adorable Darlings’. The Female Infirmary block at the workhouse situated next to the asylum, was cleared and lent as a home for the sisters and nurses.